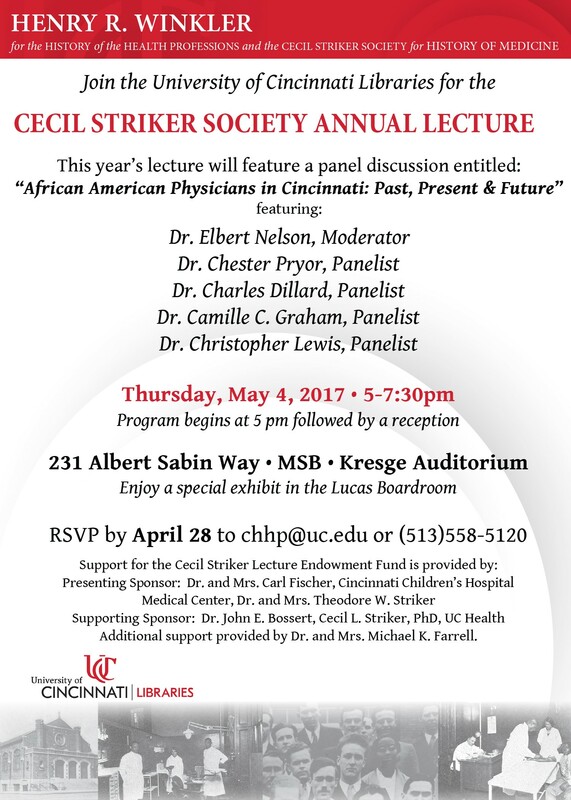 The Henry R. Winkler Center for the History of the Health Professions and the University of Cincinnati Libraries are proud to sponsor the 2017 annual Cecil Striker Lecture and exhibit. This year the program is entitled African American Physicians in Cincinnati: Past, Present & Future and features an inter-generational panel discussing challenges faced in the early integration of all-White hospitals and medical colleges, holding those doors open for others, the current state of African American physicians, and many other topics. A corresponding exhibit chronicling the history not only of African Americans in the health professions in Cincinnati, but also, the history of health care opportunities for African Americans in the city opens on the same date. We hope you can make it for this enlightening discussion and exhibit. Click on the invitation at right for more information and to RSVP. In the meantime enjoy some images from the exhibit.